Hey Linda, click on it! whew I had hoped to make something better but I my car wouldn't start up in the middle of the day in a huge ugly parking lot, without the cel phone, and I couldn't remember the cel number. And Jon was at a screening, and Dinah wouldn't answer her cel phone. The car was already almost entirely packed, and I had visions of terribleness in all forms. I called AAA and they said an hour or less, it took an hour to the dot. The hardest part was finding a pay phone. The battery needed to be replaced. The whole thing has taken most of the afternoon and we leave pre-dawn. I'll reply to all your nice posts from the last couple of days when we're in Colorado. We're hoping to get there the same day, ie zombie like on Sunday night. We're leaving for Colorado Sunday before dawn, and I tried to explain to rooster Elle about the change of living he was going to experience. He'll be outdoors, under an awning, in a large hutch. He'll have occasional sleepovers, or if the house sitter likes him, he'll get to spend time with the girls in the aviary. 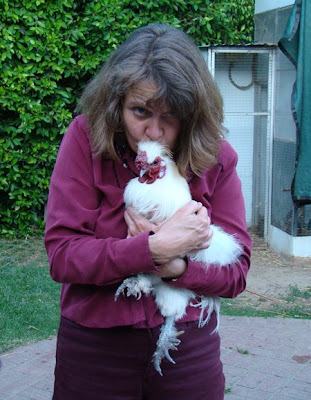 I'm really fond of this gentle rooster. He's more than six years old. He trusts me. Molly's fond of him in a different way. Should have taken the picture today, after I got my haircut, but oh well what the elle. Filled up the tank at $4.15 a gallon. Drove to downtown art gallery to pick up artwork- 50 miles round trip. Parking for 1/2 hour: $8.00. Sold no artwork-- not one piece-- not even one DVD. Show was up two months. Felt badly for the nice gallery owner. I would have bought one of her chili dogs but I've had some bad lucky getting chili dogs to my mouth in the past and didn't want to risk it. Honestly, this is too much like Yellow Submarine to be of any major significance. Considering that it came out almost a decade later, it doesn't really stand out. Creative, but not especially important; I don't know why it was selected on that "50 greatest cartoons" list. Mostly youtube posters are incredibly enthusiastic, but not grnchild. Anyway, pulled myself out of loser syndrome by going to engrish.com and enjoying its nuttiness, like cole slaw above. I was going through an old folder and found a bunch of negatives marked Hillsboro Camp. I was about to throw them out, when I thought I spotted, even in reverse, this picture I remember quite well. I scanned it and inverted the image. It's a self portrait by me taken in my sister Carol's room. that's her artwork all over the walls. I'm around 11 here and still fancying the beret. The cigarette is chalk. Fortunately I never took that up as a habit. But don't I look artistic? 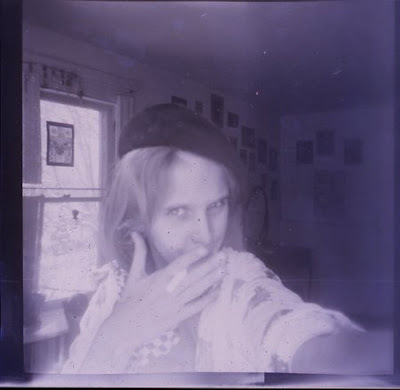 Here's a link to my earlier Beatnik shot. No wonder I like to listen to "On the Road" (exquisite audio by Matt Dillon) every time we drive to Colorado. Note that's panel 195, and I thought it would time out to 9 minutes 37 seconds. probably just as well it was never made. I visit Pepper, my old jumper, about once a week, and take him bananas and carrots and peppermints. I forgot the peppermints today, because I was going to see him straight from lunch with a friend. I felt so badly. He kept nosing my pockets. I won't see Pepper for two months, while we're in Colorado. He's well fed, and has a great friend, Row, his roommate. But he's developed an old horse disease, Cushing's Disease. It's a tumor on the pituitary, which controls various important body functions. Pepper can't shed his long coat, as you can see in these pictures. I've hired someone to clip him, but she's waiting until the temperature gets more normal, as we're going through a nutty cold spell. Pepper likes to be warm. Cushing's Disease is a bad thing. It usually comes on slowly, but unfortunately for Pepper it's come on quite fast. Well we'll see how it goes. Dinah will be living nearby as a vet tech at the horse hospital and can check on him. The fly mask looks unfriendly but keeps flies off his sticky eyes. He looked better today than when I saw him last week and gave me quite the friendly hello. It's funny with horses, the way they age: you're a year older, they're a year older. That goes on for fifteen years or so, then it changes to: you're a year older, they're ten years older. The lifespans of domestic animals are one of life's heartbreaks. 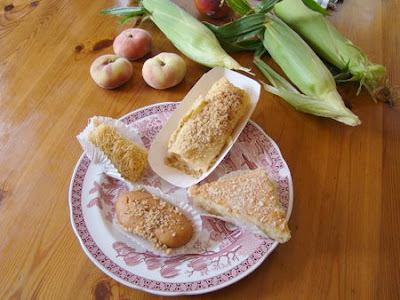 It's Greek Festival weekend around the corner. I chose to eat calamari for lunch rather than go to the David Mamet movie in Pasadena. I wasn't feeling so great yesterday and this seemed like less effort and possibly more pleasure. The festival seemed underattended, maybe because thunderstorms are predicted (freak city) and last weekend there were some shootings at another church festival a mile away. I headed straight for the calamari. $5.00 for a gigantic tray of small doughnut size rings. But, yuk, I didn't like them. They were overflavored, obviously bought that way in the bag. And you know how people complain that calamari is rubbery? One of these pieces snagged on my tooth and then slapped back at my lip just like a rubber, uh, band. Dumped that. On to the pastries. Since I knew I'd eat them all myself, I chose three I knew I liked, and let the charming lady who was putting them on my tray choose the fourth. MISTAKE! She chose that big rectangular thing in the hot dog tray, which tasted like a tortilla that had met fry bread and taken a dive in the big honey river. ick. dump that. Still have three to go. Mavis Lorenz can. She was the oldest person on our Wild Bear Adventure, 81, and as full of energy as any of us. She could whistle whole melodies in a lovely trilling style. She said her mother taught her how. I've never heard any other woman who could whistle like that. Not just a bar, but an entire melody. She liked to whistle songs for Jon and me to see if we could guess the title. But she would only do show tunes, like "oklahoma". She was insulted when I asked her to do "My Old Kentucky Home." or was it K3? when she was in her 60s as a single woman with a sherpa, entering through Pakistan. Earlier in life she'd been a p.e. teacher. whew I bet she was tough. My sister passed out these forms at the summer art class she taught, and I found it in a drawer today. Right next to the manual on handwriting analysis. Funny how the writing in example 3 looks like any doctor and the example 4 looks like certain popular fonts. walked into the dentist's office and remembered the dentist's wife's name, Lisette, for the first time in fifteen years. what's that about? Later Jon asked me the name of a weird tree element we saw in Canada, and I said, "That was an Alder catkin." The dentist mentioned the name of a homeopathic medicine that worked for his 14 year old dog and when I came home I remembered the name and looked it up on google. if only it would go on like this! Some of you were saying, "wouldn't it be fun if we all did a joint cartoon project?" I remembered "Anijam" which is on youtube but probably won't be there for long. Most animators hate youtube. I've surrendered to it. Marv invited a group of animators to participate. He didn't tell anyone in advance what the character would look like. You received the last sequence of drawings from the person who went before you, did your own cartoon with the character, and then sent your last sequence of drawings on to the next person as designated. You had to do fifteen seconds. Around this time various "jam" projects were attempted by different groups of independent animators. I never thought any of them was entertaining. There's a self portrait project I participated in too. When I got my Anijam package I was dismayed. I just did not like that character Foska at all. He was so cross gender and goofy without any sense of personality. I guess a model sheet was included. Anyway, I'd totally forgotten about it until a youtube buddy sent me a link. Later Marv Newland tried a more ambitious joint project, where a group of animators were asked to storyboard a reinterpretation of the Faust story. I still get a kick out of the storyboard I did for that. Unfortunately that project never got further funding. I could just keep posting about bear paradise for two weeks but other people's vacations can get wearying to hear about I think. There are a lot of pictures here, but I thought I'd post them in a slide show. View what you want. Here's a link to the same pictures bigger, on flickr. We had a most wondrous time at the Knight Inlet Lodge in British Columbia. We saw many black bears and a handful of grizzlies too, all from small boats at a very close distance. I'll post more pictures as the week goes by. Winter stayed longer than usual in the area, and most of the grizzlies hadn't woken from hibernation yet, but the ones we saw were magnificent. We were sure we'd like the wildlife sightings, but had no idea we'd have so much fun with the other people who'd come on this Vital Ground trip. I was surprised that for the first time in my life I could remember people's names, quite well. I wondered if this was going to be permanent. Jon said maybe it's like reverse Alzheimer's. Wouldn't that be a treat? Or not? This is an osprey. Bald eagles were almost as common as crows. They stole this osprey's fish right after he did a dive bomb to fetch it. I really enjoyed reading all your posts on my future/past blog last week-- I read them last night after we got home at ten. We were a week without newspaper, radio, computer, phone etc. Totally unplugged. It was great. I saw this wonderful sculpture on Wired, along with five others. I thought it looked a bit like a grizzly. There wasn't much information on the artist however. While I was sorting my mother's possessions, I came upon all sorts of things. 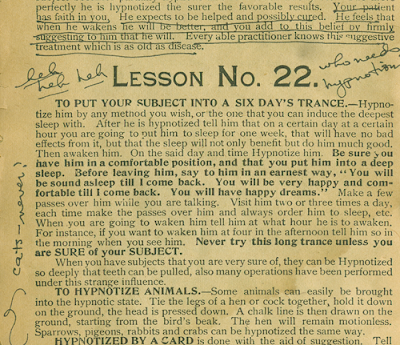 This is the actual manual which my sister used to hypnotize me one summer long, long ago. The booklet must have bee printed in the 1800's judging by the typeface and language. 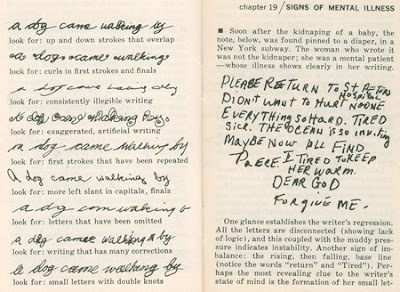 It was eerie to find her teenage notations in the margins of the booklet. 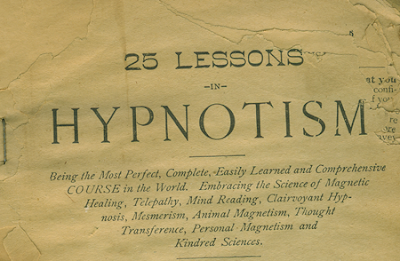 And look, there near the bottom is information for hypnotizing chickens. Or crabs. Always useful. 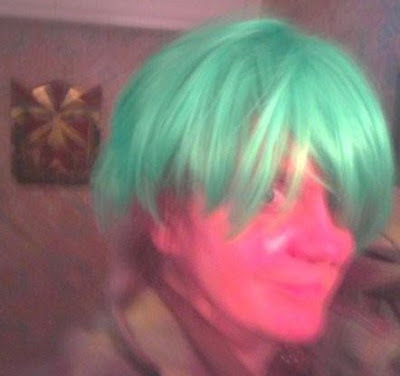 Poking around my hard drive, I came upon this silly experiment. I used to spend a lot of time experimenting with Flash code to discover odd effects. In this case the buttons on each side cause them to change species and emotion, and still react to one another. As with many of my Flash experiments, I spent more time on the code than on the art, but I had fun along the way. We're here by the red spot. Hope we're seeing grizzlies. Hope we're not falling into the water. Hope my camera works and I can show you wondrous bear pictures next week. Have you ever seen a bear in the wild? About 14 years ago we attended the first Vital Ground get together in Montana. It was before the movie celebrities got involved. The guy who was the inspiration for Hayduke in "Monkey Wrench Gang", Doug Peacock, was there. 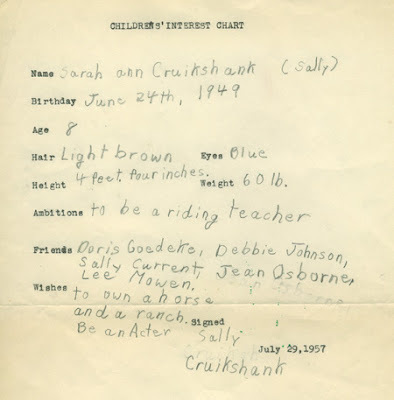 So was Jean Craighead George, the writer. Her brothers were some of the first in the usa to study grizzlies. It was a very wonderful weekend. This is a picture of Doug Seus with his much loved movie bear Bart. Bart passed away a few years ago. Doug did a training demonstration for us all, with Bart, that was one of the most amazing things I've ever experienced. He trained Bart using baked beans , Hawaiian Punch and love. In this shot he's ladling the baked beans. You can see a can of punch in his belt pack. For a dog obsessed couple like Jon and me, it's very hard to go somewhere and not take Molly. But she's spending the week at a very nice kennel called the Kennel Club at LAX. We'll probably sign her up for yappy hour, picnic in the park, and pooltime. She just gets a standard kennel, but if you want to pay you can get one of the theme rooms above which even come with tvs and vcrs. The VIP suite comes with a human who sleeps over. They used to offer web cam too but their menu of extras seems less eccentric this year. She's stayed here before and didn't seem upset by the experience. We won't be at the racetrack today-- we'll be at airports- three of them. We'll spend the night in Campbell River. 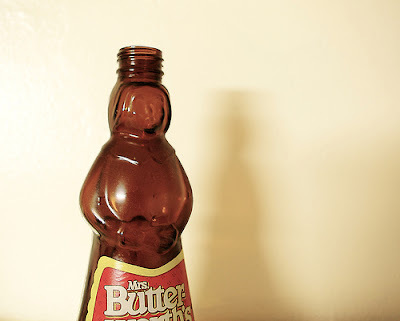 For some reason I've had nightmares about big Mrs. Butterworth syrup bottles all week. Probably symbolic after visiting my mother. Although she's never been heavy and is now 93, for many years while she lived alone she ate a pound of butter or more a week. I'm testing this to see if it refreshes during the day. This is the floating lodge where we will be staying next week on our Wild Bear Adventure. We imagined we'd travel lots after Dinah left for college, (or rather Jon imagined that), but the reality of flying both financially and physically, plus psychololgical abuse at the airport, has made us slow to move. This is our big trip for this year. 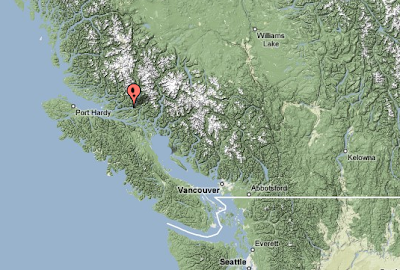 On Sunday morning we're flying to Campbell River, B.C. Canada for the Wild Bear Adventure. We're staying at Knight Inlet Lodge and hoping to see GRIZZLY BEARS! And maybe orcas too. It's the time of year when the bears have just come out of hibernation and the cubs are walking with the sows. The trip is sponsored by Vital Ground, an organization that saves land for grizzlies through easements and purchase. We'll be hearing lots of presentations on grizzlies. The lodge is floating, and we'll mostly be in boats and kayaks. The last time I was in a kayak I flilpped it over, so Jon's a little worried about that. 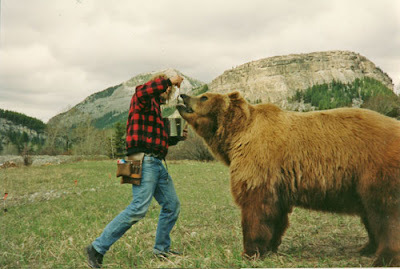 We went to a Vital Ground conference many years ago in Montana, but the only bear we saw was Bart the Bear. I'm preparing blog posts for every day I'll be away, so you won't all just disappear. We get back the following Saturday, with no communication possible in the meantime. 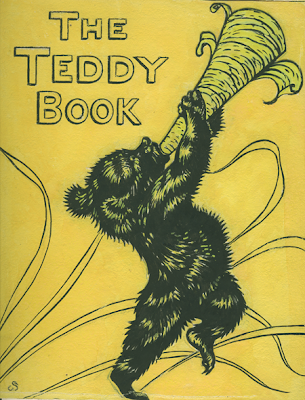 The illustration was the cover for a bear book my mother wrote and her cousin illustrated, sometime in the 1940's. So I'm sitting here peacefully reading mean jean's blog and wondering if those stairs are in her house when Molly runs past me hysterical and starts barking at the back door. The chickens are out. I run to the door and see a hawk sitting on top of the aviary. Our rooster Elle is standing in the open growling and no chickens are in site. I make pow pow sounds and wave my hands while Molly keeps barking. (I didn't let her out.) The hawk won't leave. I jump up and down, then look at the sky as a great blue heron flies right over the garage. EEK! They eat koi. I scream into the house for Jon, who's watching "Beyond the Valley of the Dolls" and he rushes out. As soon as the hawk sees him he flies off. The heron is gone, and not at the fish pond. The chickens are hiding motionless in the bushes. 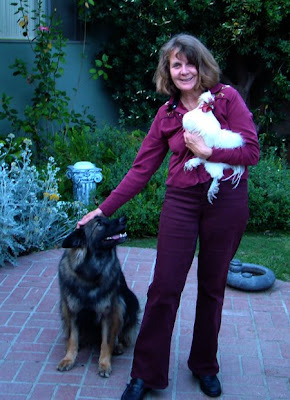 Wasn't it amazing that Molly knew the chickens were in danger? I took these pictures with the cel phone camera, figured out about micro sd chips. Color above straight out of the camera. Guess the backyard action got me a little overheated. 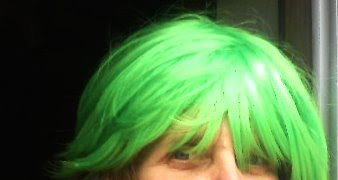 My mother bought this wig at B.Altman's in the 60's. It always looked becoming on her. The label says "Kenneth Comfortable Wig" . 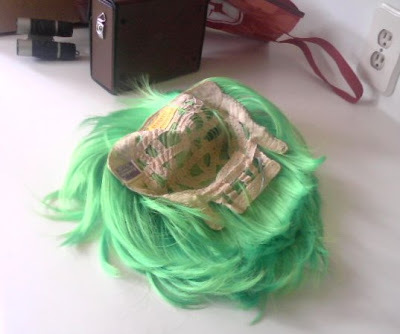 You can see the wig had fancy construction. I think Dinah will enjoy it. 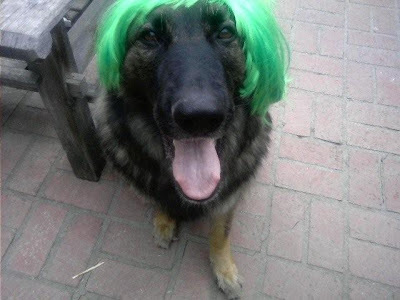 But let's face it- this wig was meant for Molly. Thanks for all your nice comments and the wonderful postcards I received last night when I got back. It's so nice to be home , and a treat to fire up the computer again. I woke up at 3:30, stayed in bed until 4. East Coast time on the West Coast is no fun. When it gets closer to daylight, I'll go to Lake Balboa with Molly. Sorry to duck out so suddenly on the party. 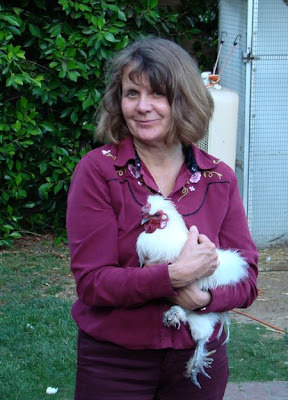 My long ago friend from England, Jayne Pilling, was here for a day and then it was off to Medford, NJ to help my mother move to assisted living. I took my laptop but it was just a weight on my shoulder. I'm learning that there are friendly airports and cheap skate airports-- some provide free wireless connection (I think Atlanta was one) but most send you to some site where they want $8.00. Anyway, I hit the ground running at my mother's place, plowing through dressers and closets to winnow down her possessions so they could fit in one room. She was living in a two bedroom apartment with many closets, filled with a trimmed down collection from 93 years. I stayed up late, I got up early. I pushed dolly after dolly down the hall, skirting in and out of the traffic: walkers, wheelchairs and the dreaded scooter cars with flags that never slow down, then up the elevator, around the corner-- oops sorry-- didn't see that walker, and into my mother's new room. It's a pretty room with a balcony that overlooks two magnolia trees and a greenhouse-- green grass and birds singing. It's a big room. I took a picture on the cel phone but have no idea how to get it from cel phone to computer. There's a slot for microsd, and I'm not sure if that's the same as the small plug that came with my Sony camera. I read two books on the airplanes: Sherwood Anderson's Winesburg, Ohio, and Memories of a Catholic Girlhood by Mary McCarthy. Both books are strong and rough and memorable. I was surprised that Kevin McCarthy, the father in the Twilight Zone (movie) episode I worked on, was Mary's brother. I'm only back a few days, then we're off on our long anticipated Wild Bear Adventure in Canada. More on that later. It's almost daylight.